An attractive shaped ceramic Owl trinket box by 'Pointers of London'. Open the box to reveal a further picture of a flower inside the lid. A lovely gift. 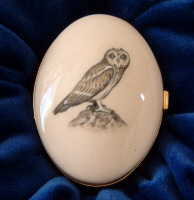 A pair of oval cufflinks with owls perched on a tree stump scene. Silver edging and a t-bar fitting. Nicely boxed. An owl pattern, limited edition self tie bow tie with embroidered perched owls on a navy blue dickie bow. Made in the UK.